Leaving the Sea, by Ben Marcus. New York, New York: Knopf. 288 pages. $25.95, hardcover. When I joined Versal back in 2010, I was curious what other editors at the journal were reading. I was most interested in what Robert Glick, my fiction editor was intrigued by, and in response to my asking he gave two suggestions: read the Collected Fictions of Borges (which he kindly gifted to me), and devour Ben Marcus’ first short story collection The Age of Wire and String. Reading these two authors meant I could tackle about anything we saw in the slush pile. Placing these two authors into the same camp might seem like a strange combination at first nod, but after reading both books I had to admit: it made sense. Borges, in his iconic way, was able to capture entire universes in his stylized prose, wrangling the infinite into taut and compelling sentences. Marcus, on the flipside, was busy unraveling language to the point where metaphor was all and sentences unfurled into infinite spirals of meaning. A protégé of Foucault and Wittgenstein (or so I assumed), Marcus was deconstructing the known with the unknown of human language. 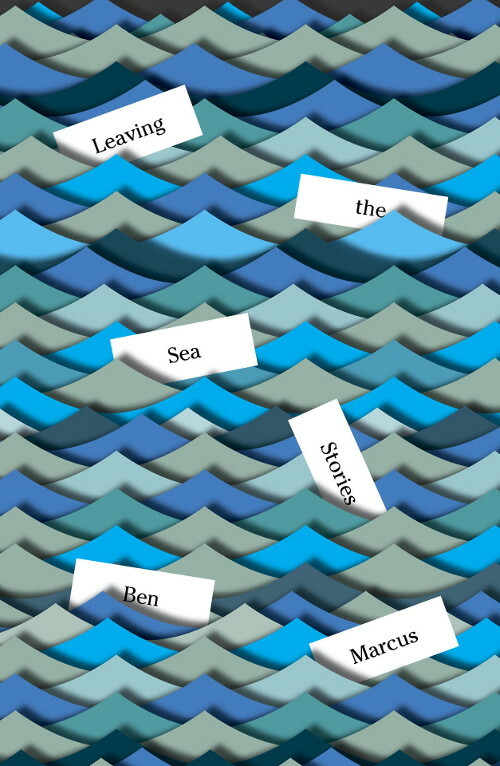 This is perhaps why Leaving the Sea—Ben Marcus’ new collection of short stories—is such a surprise. Anyone following Marcus’ career has seen stylistic changes over the years—his most recent novel, The Flame Alphabet, pretty much resembled in prose (not structure) his more middle road contemporaries. However, this offering did not prepare us to see Marcus take on more traditional storytelling techniques in earnest for Leaving The Sea. These collected stories read more like The New Yorker fodder than experimental literary journal fare. In fact, several of the stories from the collection including “Dark Arts,” “What Have You Done,” “Rollingwood,” and “I Can Say Many Nice Things” have made excerpt appearance in The New Yorker over the past year. Not bad for the pocket I’m sure. If readers have followed these sporadic appearances, they’re sure to have realized that the new fiction being pumped out of Marcus’ office almost seem a contradiction to the work we are familiar with; the gnarled prose of The Age of Wire and String, the lack of plotting in The Flame Alphabet, are gone. But don’t take this as a sign that it’s all gone to hell. In “What Have You Done,” the first story in the collection, we’re treated to forced perspectives and word play that plays with our perceptions just as Marcus once played with our understanding of language. The first few pages will have most readers wondering just who this main character is in a delightful and exciting way. Though ultimately we’re lead into a fairly straightforward story, readers shouldn’t feel let down; we’re still being challenged. What we read here is not as dangerous as before, but we should still be wary of sharp turns. Certainly “purists” from the early days of Marcus’ career will cry foul and suggest that Marcus has fallen into the traps he outlined in his famous essay in Harper’s in response to poking by Jonathan Franzen. Some of these “purists” will continue, arguing that Marcus, now a father and gaining popularity as a writer (he was recently seen in GQ this year), is slipping in his old(er) age. But these so-called purists (who I have imagined and so-named here) would be wrong to completely disregard the new directions found in Leaving the Sea. “Dark Arts” and “The Loyalty Protocol” boast fleshy characters, forced perspectives that both disorient the reader and make her really feel something special, some truly gorgeous sentences, and a thoroughly fun treatment of trope and genre. They alone make reading the collection worthwhile. Marcus has developed into a writer capable of delivering the goods even while jettisoning his old experimental style and working instead within the restraints of “normal” narrative structure. In an interview posted on YouTube by Knopf Doubleday, Marcus talks at length about having to grab a reader’s attention, not assuming that the reader will continue with a story out of a “sense of obligation.” We can hypothesize from this that Marcus has been at work developing a style that will capture more readers. The protagonist in “I Can Say Many Nice Things” complains that more people read a travel pamphlet than his own books, perhaps a nod to the small audiences Marcus drew with his more experimental works—methinks the author has shown his hand. Though the collection is strong throughout, there are places where Leaving the Sea sags. The inclusion of a linguistically experimental work in the second section of the book, a pseudo-interview interested in unpacking dense prose and information at lightning speed at the expense of a real narrative, is a confusing choice for the collection. All the hard work Marcus lays out in the beginning of the book, creating a world in which his miserable characters can truly live, is somewhat deflated by a return to old forms. The story’s structure and treatment of language feel somewhat out of place in the new syntax of Marcus’ prose. If the purpose of this book was to challenge the preciousness of Marcus’ “King of the Experimental” title, then section two was best left out. These complaints aside the book does have unity, and this is based on the revelation of delicately rendered characters that share a weariness of the way the world works around them, and an indignation in that they are also trapping themselves in their own personal hells. These characters are vessels of meaning. Marcus has big things to say about literature, and us, and though we love the playfulness of the old style, Marcus’ powerful messages were being lost in the sea of words he was busy sewing together into a complex net. Rather than decry the loss of an experimental icon, perhaps we should rejoice that Marcus has left the sea and joined the rest of us on land. This brings us back to that witches brew of Borges and Marcus. Borges understood that by utilizing the infinite he could affect the perceptions of his reader. He did this by telling us stories we could relate to while creating a hyper mythical reality. Marcus, it seems, has learned to cherish the straight road while retaining his insidious use of metaphor and his love of ugliness—this is to our benefit. Leaving the Sea at Amazon.com. Leaving the Sea at Powell’s City of Books. Leaving the Sea at Knopf. Daniel J. Cecil is a writer and editor living in Amsterdam, the Netherlands. He is Managing Editor of Versal, the international literary and art journal. His work has appeared in the Heavy Feather Review, HTML Giant, The Review Review, and is upcoming in Knee-Jerk.